Get creative with the children for Dad’s special day with our folding card. 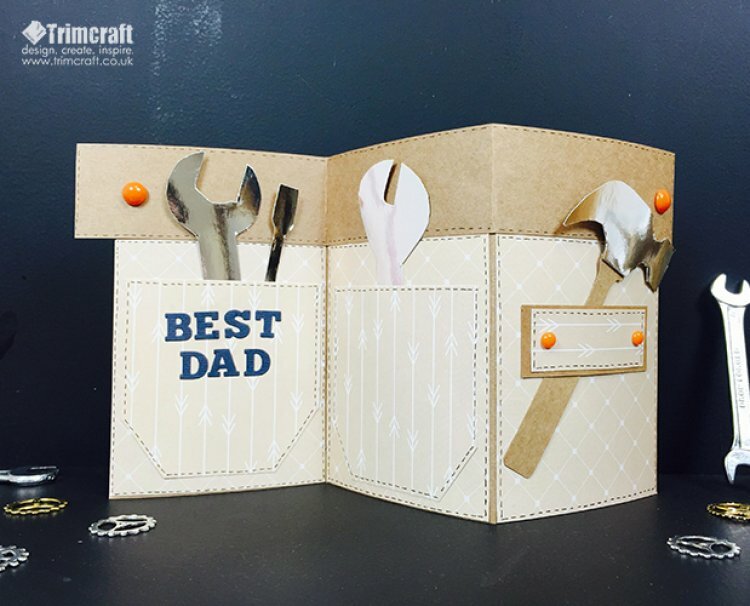 If Dad fixes everything from the leaking tap to the putting up bookshelves, he will love this tool belt folding card. 1. Cut a piece of kraft card to 27cm x 12cm, score it at 9cm and 18cm to get the fold for your card. 2. Cover each panel with patterned paper. We picked the cream check paper from the Dovecraft Back to Basics True Blue paper pack for our card. 3. To create the belt for your folding card, cut a 4cm x 29.6cm piece of kraft cardstock and add double sided tape on the bottom before sticking to the top of the card to ensure the tape is not visible on the back. 4. To make the two pockets, we have used cut out two 8.2cm squares from the repeat arrow paper and cut the bottom corners diagonally. Use double sided tape to stick the sides and bottom of the pockets and stick to the first two panels of the card. With textured cardstock, die cut ‘Best Dad’ with the alphabet die set and stick to the first panel pocket. 5. On the third panel, we created a hammer loop by cutting a piece of kraft card to 2.7cm x 6.8cm and covering it with the arrow patterned paper which was cut to 2.3cm x 6.2cm. Use tape to stick the sides of paper and stick 2.7cm down from the top of the tool belt. 6. To finish, we have added faux stitching around the card and decorated with some adhesive dots to the belt and hammer loop. 7. We have used the free printable template from the tool box gift box tutorial and enlarged it on a word document to fit in the tool belt pockets. Use the kraft paper to make the handle of your hammer and make the remaining tools with silver mirror card. Have you made any DIY inspired cards recently? We always love seeing your creations so upload them in the project gallery.